It’s a dangerous practice to let your eye get teased into visual comparisons, but I was struck by a comparison between the G Bulloides series from the Arabian Sea (which is an upwelling proxy) and Stott’s Warm Pool SST proxies. The two figures excerpted below both cover the Holocene. On the left is Gupta et al 2003 Figure 2 showing G Bulloides primarily from 723A in the Arabian Sea (I’m going to discuss a potentially problematic splice of 723A with RC2730 on another occasion); on the right is a plot of Mg/Ca-derived SST (blue) for MD81 in the Pacific Warm Pool from Stott et al 2004. In each case, one sees a similar-looking uptick dating more or less to the MWP and an elevated Holocene Optimum. Now here are both series plotted in a consistent format from archived information. 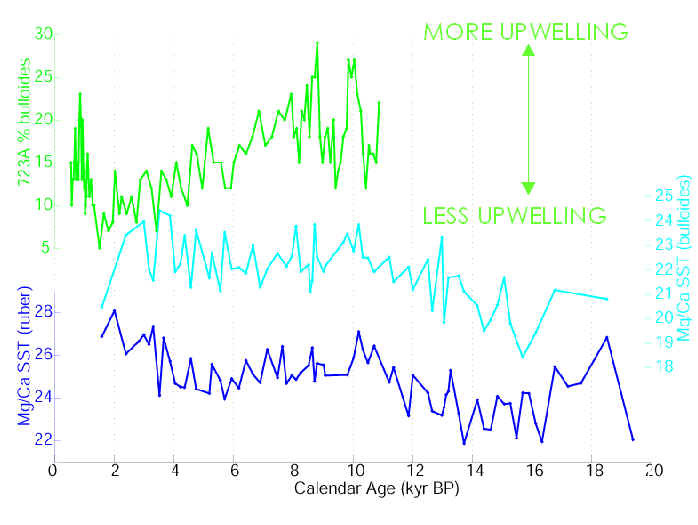 Holocene Optimum levels are higher in the G. Bulloides upwelling proxy than for the Warm Pool SST proxy, but, to me, anyway, there seems to be some similarity. I think that this impression carries over to the data when plotted on a centennial scale as below. Within the very loose dating schemes of these ocean sediment cores, I find myself being persuaded that there is actually some similarity in detail between 723A G Bulloides and the Pacific Warm Pool Mg-Ca proxy – if you indulge in a little re-alignment of peaks. I’d be inclined to align the downticks just before 1000 in 723A and just after 1000 in MD81 and try to date these features with more precise proxies. (Note that the left-right are reversed in this diagram to make it consistent with centennial-scale conventions ending on the right.) Note that Stott specifically marked an MWP at his website figure showing a slightly varied version of the figure below, where the match might even be a little better.’ In either case, the MWP appears as rather a distinct period in both proxies on a Holocene scale. Top -‘ 723A G Bulloides; bottom – Mg-Ca derived SST from MD81. Now there’s an interesting tie-in back to Lorenz et al where they primarily (and incorrectly IMHO) used upwelling sites to characterize the tropics.’ Here’s a graphic from a relatively recent PPT presentation by Oppo showing both G Bulloides and Mg-Ca SST estimates for the Arabian Sea. The top chart shows G Bulloides from 723A – with a familiar look (compare to above) -‘ while Mg-Ca’ proxies for both bulloides and ruber show an’ increase through the Holocene to about 2000 BP (the opposite to the G Bulloides upwelling proxy). It’s not clear why the Mg-Ca series don’t carry through to more modern values.’ ‘ Note that’ Oppo’s G Bulloides series does not carry forward to the 20th century, while the Moberg G Bulloides series does. What I’ll report on in another post is a very questionable splice in the Moberg proxy. This entry was written by Stephen McIntyre, posted on Jan 10, 2007 at 12:33 PM, filed under Moberg , Ocean sediment and tagged 73KA, arabian sea, bulloides, holocene, MD98-2181. Bookmark the permalink. Follow any comments here with the RSS feed for this post. Both comments and trackbacks are currently closed. Steve, you’re cranking your fascinating posts at amazing speed! I wanted to wish everybody a happy new year and remark what a great effect your website is having. I can tell just by a casual review of the media. It seems the carbon market lobbies, and that includes, whether they know it or not, the scientists who are producing the alarming reports, are responding to questions, posts and debunkings you and others make here – generally within 2 weeks to 2 months. I think 2007 will be a big year for three reasons. The new IPCC report will be one, giving you fresh helpings to dissect. (Monckton says the IPCC is a British Op, I’d like to hear more about that!) Two and three are events in the United States and Europe. In the States there is a big push for Kyoto markets by other names. In Europe the European Carbon Market “collapsed”, that is, member nations remarkably showed amazing carbon reductions! The EU is reportedly planning to re-inflate the market by raising carbon caps, which will bring the merits and real purposes of carbon trading greater attention. I’ve even seen the BBC broach the subject! In reaction we will see an increase of alarmist propaganda about catastrophes, tipping points and consensuses. BTW, I don’t hear about the polar cap anymore, did the region near North America freeze over again?